Quarterly budget: $500 - $60 in February - $130 in March = $310 left for spring! This month I purchased three items I'm really excited about. I actually haven't shown you guys any of these yet, but will talk about the sizing and style of them next week in a review post (I was going to post it sooner, but we've been really busy with house hunting activities). The loft dress is really beautiful - it's a bit dressier than I thought, but it's perfect for those events where you have to dress up but don't want to look like you're over dressed (I'm thinking of wearing it to a graduation event). It's currently 60% off (!!!) which is pretty amazing - I went with a size 10. 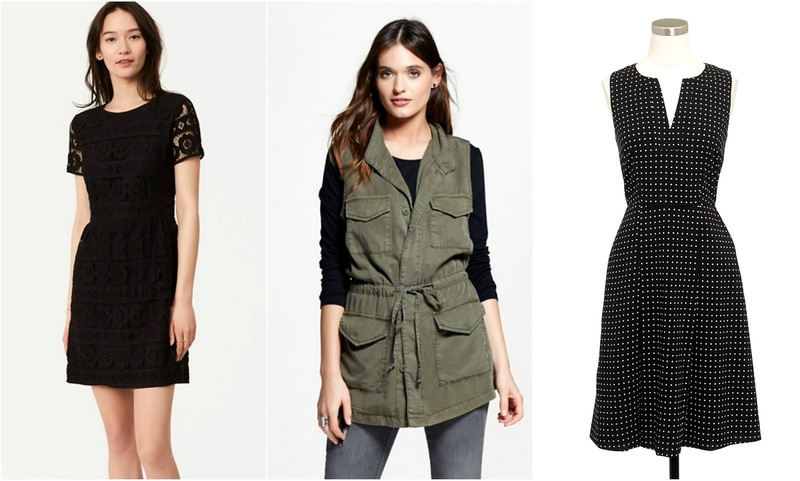 Same goes for the J.Crew Factory dress, which has a really cute white polka dots on black background. I love that it's black instead of navy, just because that makes it a bit more versatile (in my opinion!). And that vest....I have a lot of thoughts about how a style we all wore like four years ago is back right now, BUT I wore this vest like four days last week, and can't stop wearing it! I have a problem (and for under $30, you can have that problem too). I'm still waiting on my Gap order to see how much I love that embroidered top I mentioned last week, but as always, that will be included in April's budget. I am going to NYC at the end of April, so we will see where the money actually goes - if I spend it before we go in prep, or if I find something I love while there. A couple of other big purchases may be made during that trip (...eek!! ), so maybe I won't want to do any other shopping! As always, I want to mention what I received for my sponsorship work this month. I received a dress, shoes, purse, and ring from Kohl's, as well as the newest watch design from Daniel Wellington (as always, you can use the code FRANZISKA to save 15%). As always, looking forward to seeing how you did this month sticking to your budget! Please link up below, and don't forget to tell your readers to check out the other budgeting bloggers!